Director Garry Marshall’s (The Princess Bride) romantic comedy New Year’s Eve got slammed by critics when it was in theaters, but audiences enjoyed the movie and its large name-actor cast more. 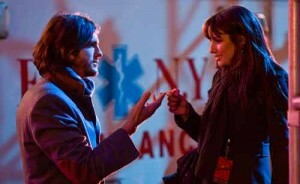 Following the lives of a number of couples and singles in New York over one New Year’s Eve, the film features a whopping amount of stars: Sarah Jessica Parker (I Don’t Know How She Does It), Jessica Biel (The A-Team), Ashton Kutcher (No Strings Attached), Michelle Pfeiffer (Stardust), Zac Efron (Charlie St. Cloud), Halle Berry (Dark Tide), Cary Elwes (Saw: The Final Chapter), Alyssa Milano (Hall Pass), Carla Gugino (Sucker Punch), Katherine Heigl (Killers), Sofia Vergara (TV’s Modern Family), Lea Michele (TV’s Glee), James Belushi (Cougars, Inc.), Abigail Breslin (Zombieland), Josh Duhamel (Life As We Know It), Hilary Swank (Conviction)… Phew! Despite bad reviews, New Year’s Eve grossed a decent $55 million when it was in theaters.